On An Overgrown Path: Which version of the truth do you want? Which version of the truth do you want? On August 27th 2014 BBC Two TV screened the first of a four part documentary Hotel India billed as "A look behind the scenes of India's oldest and most famous hotel, the Taj Mahal Palace Hotel in Mumbai". 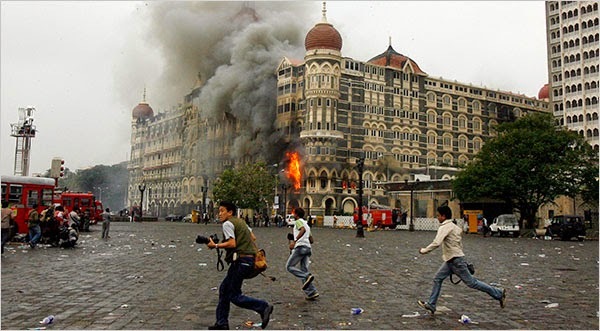 On November 26th 2008 the Afghanistan based terrorist group Lashkar-e-Taiba attacked a five-star hotel in Mumbai in a city wide terror campaign that left at least 167 people dead. Anyone without prior knowledge watching the BBC's Hotel India, which the Guardian reviewer described as "PR puff", would not have connected the terror of 2008 with the hedonistic paradise of 2014 portrayed in the BBC documentary, yet alone realised that the Taj Mahal Palace Hotel was at the centre of the attacks. Thirty-one of the dead were killed in the hotel which is seen under attack in the photo above. It may be that the remaining three episodes will correct the blatant editorial imbalance - described by the Guardian reviewer as "one of the more extreme cases of amnesia" - and cover the atrocities that took place in Hotel India. It may be that these episodes will address the allegation made in the meticulously researched The Siege: Three Days of Terror Inside the Taj* (p, 90) that many of the security steps recommended by the Indian police and implemented by the Taj Mahal Palace management following reliable warnings of a possible terrorist attack had been dismantled, because the luxury hotel argued "it could not be expected to sustain a war footing". Or it may be that the newly-appointed BBC Trust Chairwoman Rona Fairhead will inject a healthy dose of truth into future BBC programmes. I do not want to pre-judge Ms Fairhead, and, of course, there is no suggestion that she had any influence on Hotel India. But the following is an illustration of the tensions that can arise when a corporate high-flyer is appointed to a senior position on the governing body of an editorially independent broadcaster. The new BBC Trust chairwoman is a former ceo of the Pearson owned Financial Times Group and continues to hold positions as a non-executive director of PepsiCo and HSBC. While over on the Indian sub-continent, multinational conglomerate Tata Group has its headquarters in Mumbai close to the Taj Mahal Palace Hotel. Its subsidiary Tata Interactive Systems numbers Pearson Education among its clients, Tata AIA Life Insurance has a partnership with HSBC, Tata Global Beverages has a joint venture with PepsiCo, and Tata's Indian Hotels Company owns 108 luxury hotels around the world, including the Taj Mahal Palace, otherwise known as Hotel India. I am sure Rona Fairhead will inject a healthy dose of truth into future BBC editorial coverage. But which version of the truth will it be? * For an objective and thoroughly researched account The Siege: Three Days of Terror Inside the Taj by Adrian Levy and Cathy Scott-Clark is highly recommended. Header image is via ComingAnarchy. Any copyrighted material is included as "fair use" for the purpose of critical analysis only, and will be removed at the request of copyright owner(s). Also on Facebook and Twitter.